What is affiliate marketing and does it benefit me? 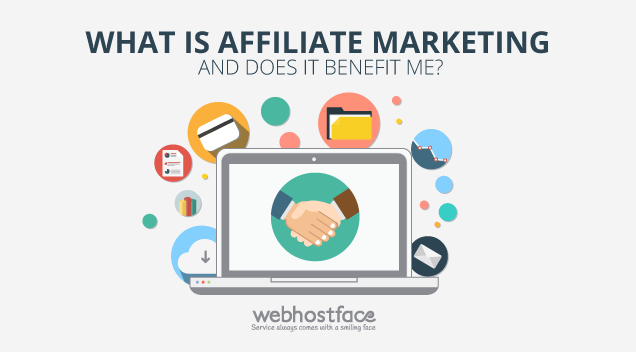 Home >> Affiliates >> What is affiliate marketing and does it benefit me? In just a century or so, the communication industry has grown from simple paper letters, sent via pigeons or inside a bottle across the sea, through telegrams and telephone, to today’s global web surrounding our whole planet. With just one click, you can say “Hi” to a friend or relative on the other side of the world. That is the power of “the Internet”. Since the internet is globally accessible by everyone around the world, it is only natural for people to use it for commercial and marketing purposes. Today, you can easily get “inside” by making your own personal web page accessible worldwide, and start making some cash by promoting and advertising. How can you do that? Easy! Become an affiliate! Put in simple terms, affiliate marketing is when a company offers someone (an affiliate) to promote their services online and this person gets a commission for referring customers. The affiliates get paid according to a particular agreement. The agreement is usually based on the number of people the affiliate sends to the referred website (seller) or the number of people who buy something or perform some other action on this site. Some arrangements include payments according to the number of people who visit the page containing their site’s advertisement. Basically, if a link on an affiliate site brings the seller traffic or money, the seller pays the affiliate a commission according to their prior agreement. Pay-per-sale – The merchant site pays an affiliate when the affiliate sends them a customer who purchases something. Pay-per-click – The merchant site pays the affiliate a commission based on the number of visitors who click on a page on the seller site. Residual program – Affiliates in these programs can keep making money off a visitor they send to the site if the visitor continues to purchase goods or services from the merchant site. Does WebHostFace have an affiliate program? We sure do! As a company, who is focused on people-oriented approach and helping small businesses, our affiliate program has been specially developed to help you help us! With just a few clicks, you can start making some extra cash for that dress with the flowers you wanted so much, that really cool mountain bike, or just to pay your rent or bills. Does it cost anything? Nope… it’s totally free! Create an account, throw in some banners on your website, and you are ready to go! We provide you with a redundancy of banners in different sizes, colors and types, which are instantly available inside your affiliate account! You don’t have a site? No worries, you can simply post a link on your social media accounts and YouTube channel or you can simply drop an email to your friends, who need high-quality hosting! Writing a review of our services will usually work better though as people love reading personal experience rather than clicking on random banner ads. You can check our website and affiliate area for tips and tricks for maximizing your earnings, as well as our attractive payout terms. Are you ready to delve into affiliate marketing? Feel free to check our affiliate program! We would also love to hear your opinion in the comments below and it would mean the world to us if you share this valuable piece of information with someone in need. Bogdan might initially give you an impression of a shy and laid-back person but given the chance he will amaze you with his vast knowledge of the in's and out's of hosting. Carved in the dark caves of the WebHostFace Academy, he is a perfect example that ambition and willingness to learn can take you a LONG way. ← How to Troubleshoot your WordPress Website? Are Google Now searches getting smarter? Thanks for post affiliate marketing intro. I know only basic things. My friends are using products to earn money online on their home. I am registered WebHostFace Affiliate account. nice discuss about affiliate marketing. i like the post. Pay per sale makes sense and also seems helpful for small business, Thank you for this information.